In conjunction with the release of the new Call of Duty: Modern Warfare 3 video game, Jeep recently announced a special edition of the new Wrangler in the 2012 Jeep Wrangler Call of Duty: MW3 Special Edition SUV. What's more, Jeep will actually be giving away the very first vehicle that comes off the line! 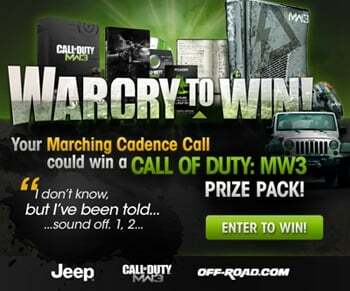 This is the second year the Jeep brand has partnered with Activision on the Call of Duty franchise, and Jeep will be giving away, via its Facebook page, one of these unique MW3 Wranglers. Visitors to Jeep's Facebook page can also enter more times by playing the Jeep Ops game there as well.